When a Western Christian first encounters talk of the ‘energies’ and ‘essence’ of God, this concept seems bizarre, foreign, silly, even heretical. However, if we examine the writings and ideas of St. Gregory Palamas within the great tradition of theologians and mystics within which he stands, we find that, rather than being heretical, his ideas are, in fact, sensible. They are a synthesis of the dogma of the theologian and the experience of the mystic, steering a course that is able to maintain both the transcendence and immanence of God; such a task is very difficult and fraught with many dangers, as we may be tempted to fall off the horse of orthodoxy in either direction, making God the transcendent creator of deism or the immanent spiritual force of pantheism. Palamas gives us a holy, transcendent, immanent, loving God — a God to believe in. One of the fundamental realities about the patristic and Byzantine understanding of God is the ultimate transcendence of the divine Person(s). Since God is transcendent, Palamas tells us that our understanding of Him is not, cannot be contingent upon secular, pagan learning — be that learning Greek philosophy or postmodern physics. Rather, our understanding of God is based upon our own initiation into His self-revelation to humanity through the Scriptures, tradition, and the spiritual, mystical experience of the individual believer. Palamas shows us this reality of the unknowable God’s ‘knowability’ through consistent reference to the Scriptures and the sayings of the Fathers, from Athanasius and Gregory of Nazianzus of the fourth century to John Climacus and Maximus the Confessor of the seventh. If we begin with the proposition that God is incomprehensible and his essence unknowable due to the vast gulf that separates Creator from creature, then a paradigm for interpreting the mystical life becomes of paramount importance, for mystics throughout history claim to have encountered this inaccessible, transcendent God. The Judaeo-Christian mystical tradition stretches at least as far back as Moses who saw the back of YHWH on Mt. Sinai (Ex 33:18-23), and includes Isaiah (Is 6) and Ezekiel (Ez 1) as well as the experiences of the disciples upon Tabor, the Mount of Transfiguration (Mt 17:1-9, Mk 9:2-9, Lk 9:28-36), and Paul who was ‘taken up to the third heaven’ (2 Cor 12:1-5) — these last two being of great importance for Palamas in The Triads. Finally, Christ Himself says, ‘Blessed are the pure in heart, for they shall see God’ (Mt 5:8). The biblical roots of the mystical encounter with God, then, are strong. The ascetic, hesychastic tradition within which Gregory stands is also focussed upon the mystic’s vision of and union with God. Purity of heart, according to John Cassian, is the goal of all ascetic discipline, the end of which is the vision of God. This mystical, ascetic tradition runs in the East through John Climacus (d. c. 649) to Gregory Palamas to Seraphim of Sarov (d. 1833), John of Kronstadt (d. 1908), and the twentieth-century Athonite hesychasts Joseph (d. 1959) and Paisios (d. 1994), while in the West it runs through John Cassian (d. c. 435) to Bernard of Clairvaux (d. 1153), Lady Julian (d. c. 1416), St. Teresa of Avìla (d. 1582) and moderns such as Evelyn Underhill (d. 1941) and Thomas Merton (d. 1968). The goal of all of these contemplatives and mystics is, as stated above, union with God; the experiences of many of them are reflected in Palamas’ writings. Palamites sought this union through silence and quiet (hesychia), uniting their hearts with their minds so that as purified, psychosomatic unities they could see God Himself through the uncreated light — a potential impossibility, as becomes clear. Gregory’s chief opponent in the Hesychastic Controversy of the fourteenth century was a Calabrian monk named Barlaam. Barlaam believed that God, the uncreated Creator, was completely inaccessible, making no distinction between His ‘energies’ and ‘essence.’ The visions of the prophets, apostles, and saints had merely been of things created by God. The light seen by the contemplatives of the ages was created at best, or a ‘fantasy of the imagination’ at worst. St. Gregory accordingly made the important distinction between essence and energies, keeping God transcendent as Barlaamites wished yet immanent as hesychasts had experienced. And so we come to the heart of the matter. Papademetriou puts it most succinctly when he writes, ‘The energies of God as conceived by St. Gregory Palamas are “manifestations” and “exteriorizations” of God Himself. They are uncreated.’ In other words, what Palamas calls ‘energies’ are not some sort of spiritual electricity coursing through the universe into which the mystic can tap — as they sounded to me when I first heard of them. No, they are the actions, attributes, and movement of God throughout the created order, emanating from his very essence and tripersonal self. Those who, like the cherubim, have become all eye, catch a glimpse of these uncreated ‘energies,’ but not of the essence of Him whose ‘energies’ they are. Gregory gives us a good image to compare with this distinction, that of the human mind, although in my recent readings he does not make explicit the comparison between our minds and God, a comparison going back at least to Basil the Great. Palamas says, ‘the essence of the mind is one thing, its energy another.’ This statement is made in explanation of how exactly one can call the mind back to the heart; in its energies, one’s mind can be all over the place, worrying and fretting about things, thinking and considering various realities. The energies of the mind can become externalised. Yet wherever these energies go, the essence of the mind continually resides in the heart. God is similar to the mind, but his energies can go further and do more, given their uncreated and boundless existence. Thus, God is able to communicate to us his properties, his actual ‘glory and splendour,’ while remaining inaccessible to us in terms of his essence. The mystics truly encounter the real God, contrary to Barlaam; however, their encounter is with the energies, not the essence of God. We can see a true, uncreated light that is part of God’s uncreated, ongoing, eternal action in this world, yet we cannot see God Himself and the fullness of His glory. This is the distinction Palamas makes, and it enables the dogma of the theologian to dovetail with the experience of the mystic, keeping Byzantine theology from driving a wedge between the two. St. Gregory Palamas gives his readers a framework for understanding God as both immanent and transcendent. His theology, on the one hand, affirms the apophatic tradition running from Gregory of Nyssa, the tradition that can only describe God in negative terms — i.e. what God is not, e.g. immutable, infinite; God in His essence is unknowable. It also makes room for the cataphatic tradition running from Gregory of Nazianzus, the tradition that can speak about God in positive terms — e.g. God is three prosopa with a single ousia; God in His energies is accessible to the pure in heart. The point of the hesychastic life is to purify the heart through prayer and ascetic ordeal, thereby coming to the beatific vision and the grace of the uncreated light, a wonder so glorious that those who have beheld it often have shining faces to reflect that light. Palamite theology is not heresy, and it is not nonsense. It is a synthesis that enables us to make sense of the undeniable presence of the transcendent God. Re Palamas and heresy, see George C. Papademetriou, Introduction to Saint Gregory Palamas (New York 1973), 20. The Triads, ‘Philosophy does not save,’ I.
 Cf. Conference 1; Cassian is the only Westerner in the Philokalia. See also Evagrius Ponticus, Kephalaia Gnostica 1.27,70, who argues that contemplation of the Holy Trinity is the greatest thing one could ever achieve. On the influence of Evagrius on Byzantine monastic theology, see John Meyendorff, Byzantine Theology (New York 1979), 67-69. One example of many is Palamas’ statement that ‘the saints contemplate this divine light within themselves,’ reflecting the heart of the experience of St. Teresa of Avìla’s Interior Castle. This is the system of prayer laid out by Palamas in section C of this week’s readings, and it is one of the types of monasticism practised by the monks of Athos today, as seen in Elder Joseph the Hesychast, Monastic Wisdom (Florence, AZ 1998). George C. Papademetriou, Introduction to Saint Gregory Palamas, 22-24. Cf. Gregory Palamas, The Triads, ‘The Hesychast method of prayer, and the transformation of the body,’ II.ii.9. This phrase shows the common western Christian bias towards the rational intellect as the only valid road to God. 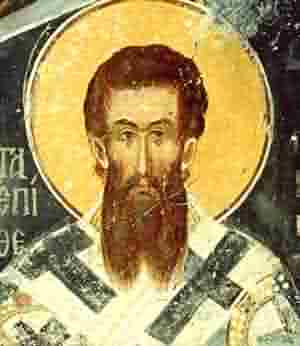 Introduction to Saint Gregory Palamas, 43. Gregory Palamas, The Triads, ‘Apophatic theology as positive experience,’ I.iii.21. Cf. Benedicta Ward, trans., The Sayings of the Desert Fathers (Kalamazoo 1975), Bessarion 11, p. 42. The Triads, ‘The Hesychast method of prayer, and the transformation of the body,’ I.ii.5. That Palamas believes the mind to reside in the heart, not the brain, is evidence of his extensive reading not of pagans but of Christians, since pagans had established the residence of the mind in the brain in the writings of ‘Hippocrates’ in the fourth-fifth centuries BC. Cf. Irenaeus, Against the Heresies, II.13.4 on God’s boundlessness as well as on His uncreated light. Gregory Palamas, The Triads, ‘Apophatic theology as positive experience,’ I.iii.23. Both Gregory of Nyssa and Gregory of Nazianzus could be said to make use of both the apophatic and cataphatic tradition. Nyssa, however, is most famous for his postulation of knowing God in the darkness. Besides the biblical precedents of Moses, the Transfiguration, and Stephen, Timothy Ware, The Orthodox Church (Harmondsworth 1963), draws our attention to St. Seraphim of Sarov (pp. 131-132) and Evelyn Underhill (p. 239n.) who both underwent similar experiences. So I meant to do a post on St. Teresa of Avila last week. And then I didn’t. St. Teresa of Avila (1515-1582) rocks. Hard. She was a Discalced (“Shoeless”) Carmelite nun involved in the Catholic Reform movement of the sixteenth century, along with our friend St. John of the Cross (saint of the week here). Sts. John and Teresa took their part in the healing of Christ’s church in sixteenth-century Spain particularly through the reform of the Discalced Carmelite monastic order. This is a reminder that Catholic Reform wasn’t simply sending out the Inquisition to burn a few Prots. For the record. St. Teresa, like St. John, was a contemplative and a mystic. She was blessed by God both with visions as well as with genuine spiritual insight. Thus she was able to help lead her monastic community of nuns well and help work through reforms. Even if some of her confessors doubted her visions. But men are like that. St. Teresa of Avila is most famous for her book Interior Castle. I read the translation by E. Allison Peers, whose interest in Spanish literature and mysticism has blessed us with translations of St. Teresa’s works as well as St. John’s and a fine biography of my old friend Ramon Llull. Anyway, Interior Castle is amazing. St. Teresa had this vision, see, and it was of the mansions of the spirit. As in, your own spirit. And first you get past the outer world which is full of distracting lizards and stuff like that. Then you get further and further into the castle/through the mansions. Each mansion is about the cleansing of your soul at some level and what each stage looks like. At the centre, when God has purified your heart through prayers and effort and trials and, ultimately, His good grace, there is the light of His Spirit. And it is there for anyone who is able to enter into the stillness and take the effort to stop being distracted by the lizards. But most of us, unlike people like St. Teresa, St. John, St. Gregory Palamas, Evelyn Underhill and Thomas Merton, spend much of our lives gazing at those damned lizards. And that’s not the blessing that calls us to. He calls us to a union of love with him. So spend time in quiet. In silence. In prayer. With Jesus. Enter the mansions of the spirit. Find Him in the light at the centre of your soul, calling out to you gently while you’re busy staring at lizards and honey badgers. This Tuesday, we’ll be moving along from the mysticism of Evelyn Underhill to the theology & exegesis of Martin Luther. However, this is most appropriate in my opinion because we need to have a firm underpinning of doctrine & theology in our minds before we embark on the journey of contemplation and mysticism — else we end up heterodox like Origen, Evagrius, Meister Eckhart, Madame Guyon. The life of prayer as we looked at it in Underhill is to be intrinsically connected to the life of the intellect and the reading of Scripture. Our reading shall be his “Preface of the Epistle of St. Paul to the Romans.” It’s about 14 pages long and crammed full of ideas and teachings; I heartily recommend you read it more than once. It is online here. If you have time, also check out the Christian History article and his 95 Theses. This coming Tuesday we’ll be discussing Evelyn Underhill (1875-1941), an Anglican mystic. We’ll be reading excerpts from The Essentials of Mysticism as anthologised by Richard J. Foster & James Bryan Smith in Devotional Classics, HarperCollins, 1993: 113-117. You can’t read it online. You can, however, read the entirety of her best-known classic work Mysticism at the Christian Classics Ethereal Library! For more info on Underhill, check out the Evelyn Underhill Association. I’m excited because I’m especially fond of mystics, missionaries and ascetics (hence the love of St. Francis who was all three).